WASHINGTON, Jan. 28, 2019 – Perdue Foods, LLC, a Bridgewater, Va. establishment, is recalling approximately 16,011 pounds of ready-to-eat (RTE) chicken nugget products due to misbranding and undeclared allergens, the U.S. Department of Agriculture’s Food Safety and Inspection Service (FSIS) announced today. The products contain milk, a known allergen, which is not declared on the product label. 12-oz. 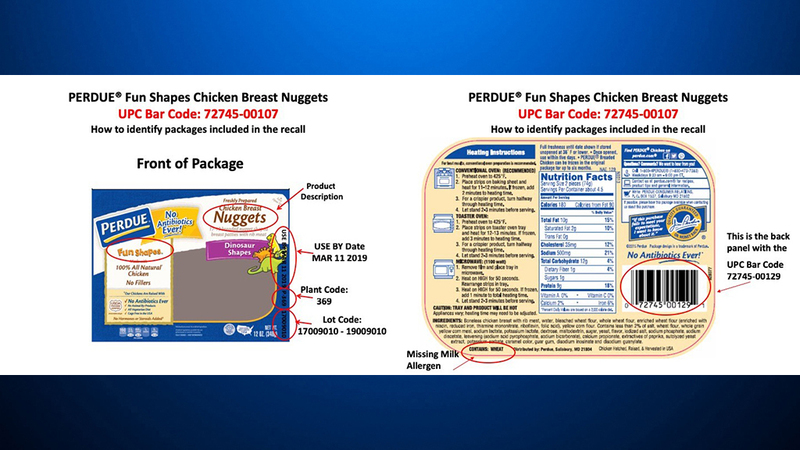 packages of “PERDUE Fun Shapes Chicken Breast Nuggets” with a “USE BY” date of “MAR 11 2019” and lot codes 17009010 – 19009010. The products subject to recall bear establishment number “P-369” inside the USDA mark of inspection. These items were shipped to retail locations in Connecticut; Delaware; Washington, DC; Maine; Maryland; Massachusetts; New Jersey; New York; Ohio; Pennsylvania; Rhode Island; Vermont; Virginia; and West Virginia. The problem was discovered when a retail store notified the company of an incorrect label. The establishment investigated and determined that the incorrect back label was applied to the product. There have been no confirmed reports of adverse reactions due to consumption of these products. Anyone concerned about an injury or illness should contact a healthcare provider. FSIS is concerned that some product may be in consumers’ refrigerators. Consumers who have purchased these products are urged not to consume them. These products should be thrown away or returned to the place of purchase. FSIS routinely conducts recall effectiveness checks to verify that recalling firms are notifying their customers of the recall and that actions are being taken to make certain that the product is no longer available to consumers. When available, the retail distribution list(s) will be posted on the FSIS website at www.fsis.usda.gov/recalls.